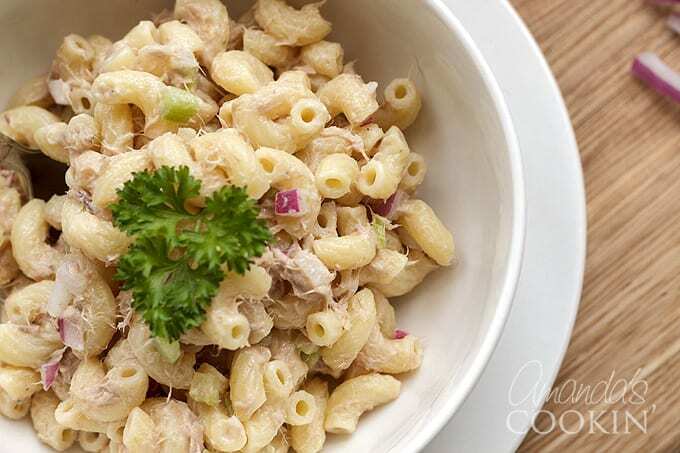 I love pasta salads and I’m a big tuna salad fan, so this classic tuna pasta salad is something I can really enjoy. 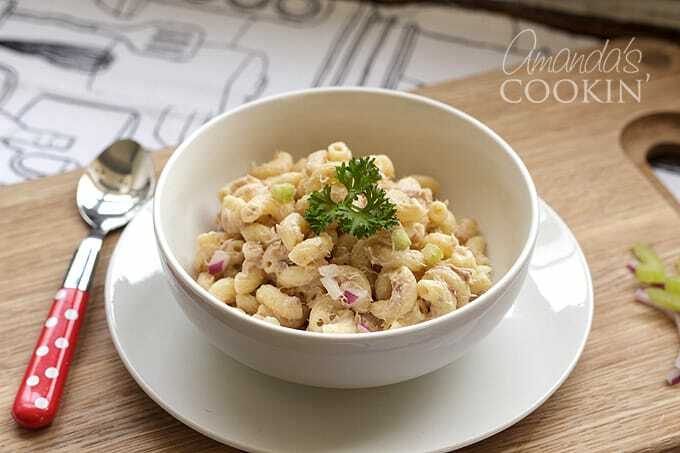 While this easy tuna macaroni salad is great for picnics and barbecues, it also great for just grabbing as a quick lunch or snack. 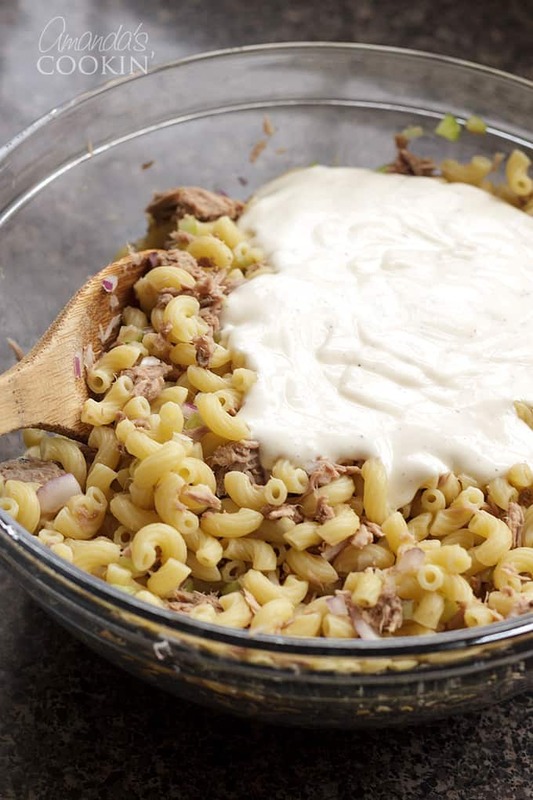 This tuna pasta salad is a classic recipe that’s been around for many years. The first time I tried it was at my aunt’s house when I was a child. She always had some sort of pasta salad in her fridge! 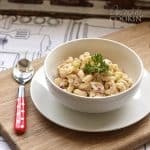 I’ve seen this same tuna macaroni salad at potlucks and barbecues over the years, and I’ve had it on this blog since 2010. I make it fairly often and keep it in the fridge to just grab and go. Pasta salads travel well in a cooler, making them great for picnics and barbecues. 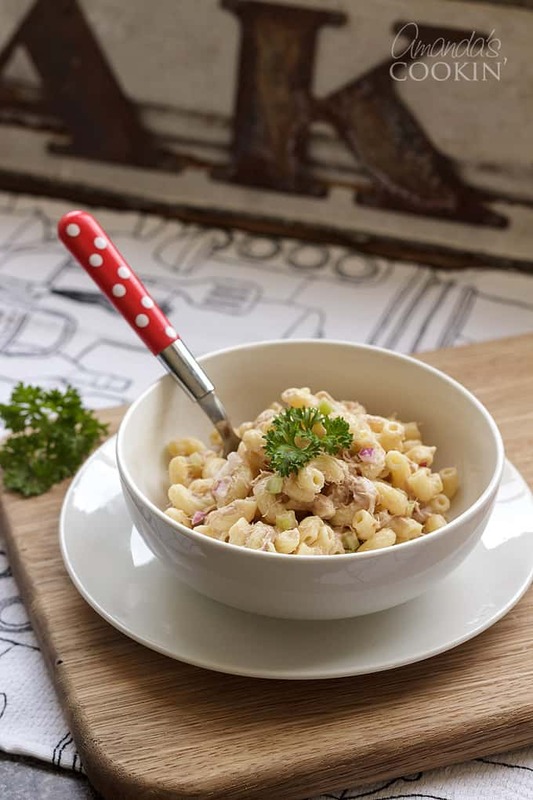 Elbow macaroni – we use elbows, but you could substitute rotini or penne pasta as well. Tuna in water – this is just better for you. There’s no need for all the added calories that come with tuna packed in oil. Celery – if you like your pasta salad crunchy, you can add a second stalk. Red onion – you could use Vidalia onion if you don’t have red onion, but white and yellow onion might be a bit too strong. Light mayonnaise – you can use full-fat mayo if you prefer, we like light mayo because there are fewer calories and fat. Lemon juice – this should be fresh squeezed, not from a bottle. Salt and pepper – if you prefer additional seasonings go for it! But salt and pepper are all that’s really needed. Large shallow mixing bowl – a shallow bowl allows you to mix and stir without things falling out the sides! Medium saucepan – big enough to boil almost a box of pasta. Cutting board – remember to use a separate cutting board for produce than you do for meats. Chef’s knife – a staple in every kitchen, something sharp to cut your veggies. Colander – for draining your pasta, be sure to rinse in cold water to stop the cooking process and remove extra starch. Wooden spoon – a rubber spatula works too. 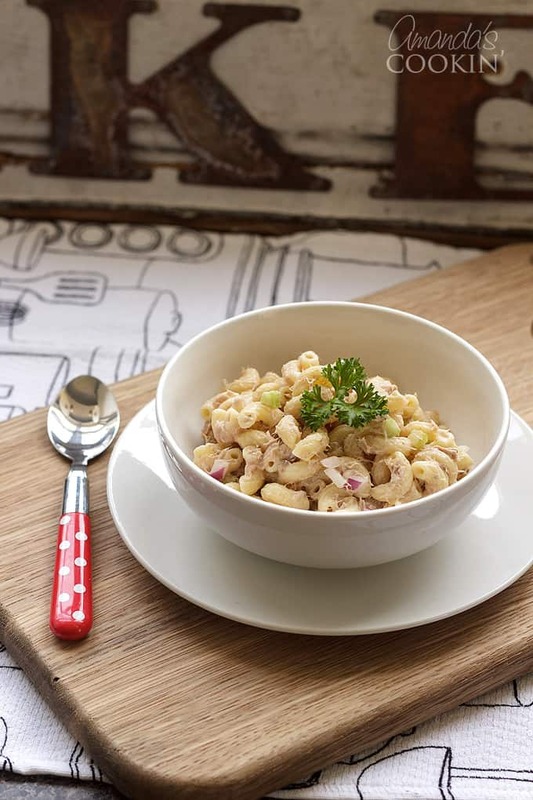 Storage container with lid – this tuna pasta salad recipe makes 9 cups, so you may need to store the extra in the fridge. 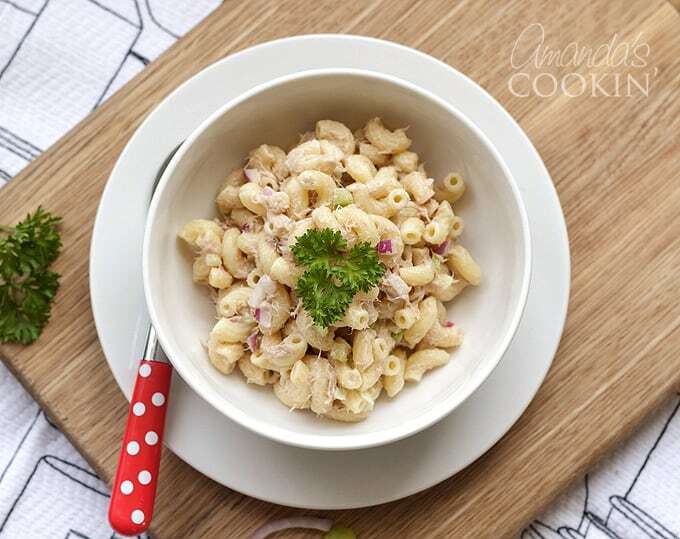 Will this be creamy tuna pasta salad? 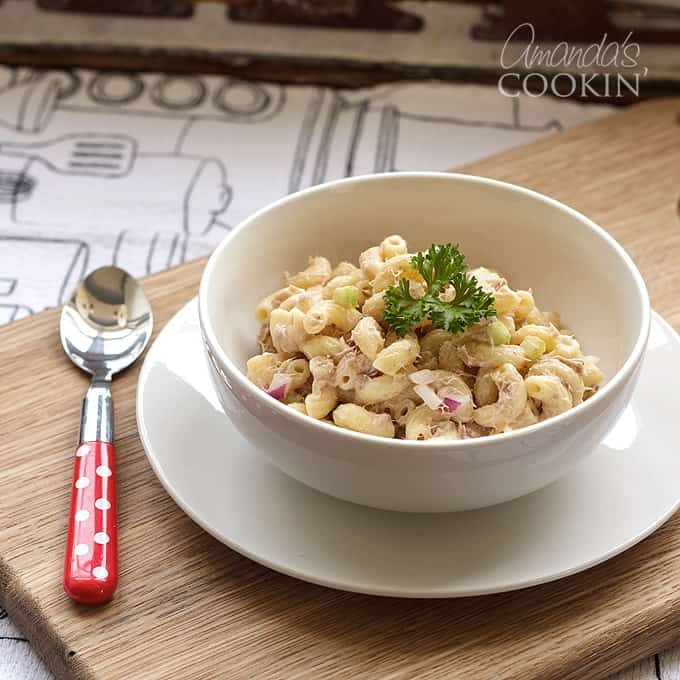 This is not a creamy pasta salad as it has just the right amount of dressing that soaks into the pasta. 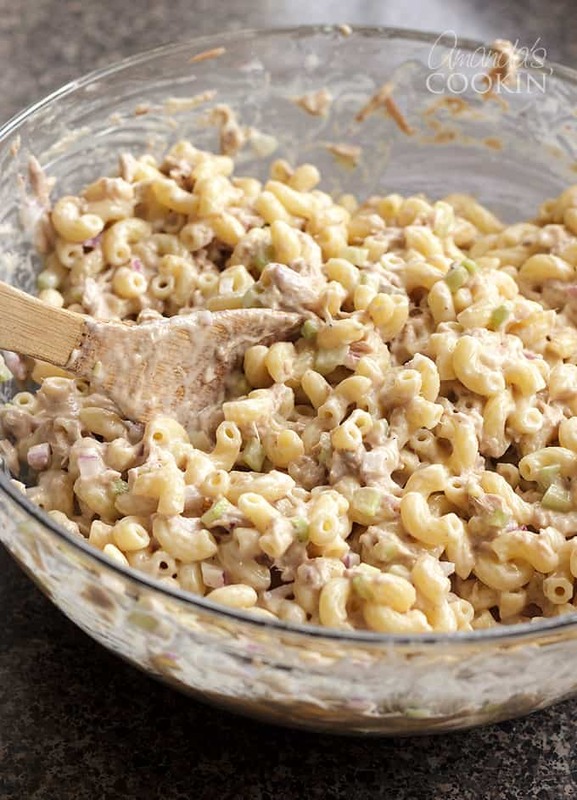 If you prefer a creamy tuna macaroni salad, you can increase the amount of dressing. Just keep in mind that this will also increase the calories and fat in your salad. 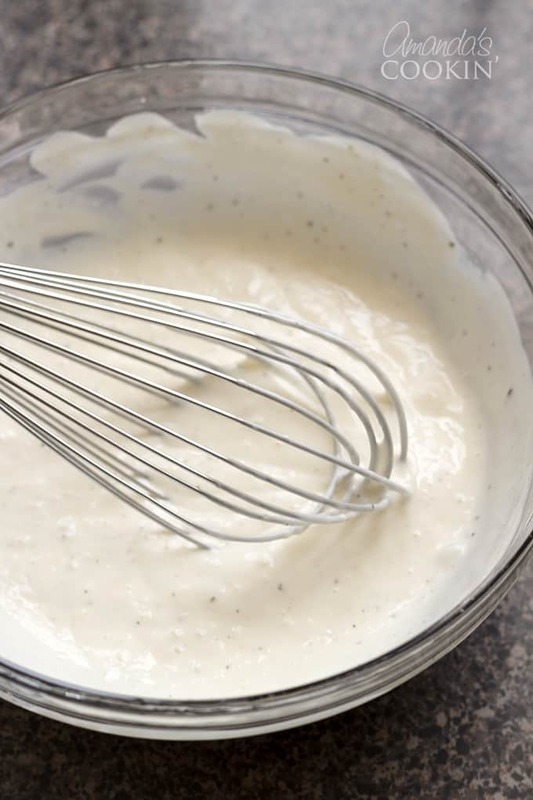 You might like our homemade buttermilk ranch dressing. It would be great instead of the mayonnaise-based dressing in this salad. Dill – you can add dill or any other fresh herb that you like. Simply stir in 2 teaspoons of dried herb or 2 tablespoons of fresh herb. Alternatively, you could use our creamy dill dressing instead of the mayonnaise dressing in this recipe. Peas – If you like a little extra crunch in your pasta salad, you can thaw 1 cup of frozen peas and stir them into the other ingredients. 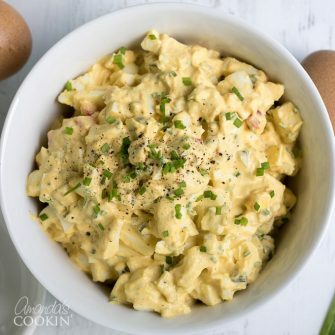 Eggs – Hard boiled eggs are also a great addition to tuna macaroni salad. Chop 2 hard boiled eggs and mix them in at the end. Italian dressing – If you prefer an Italian dressing based salad, you can use 1 cup of bottled dressing instead of the mayo based dressing I have here. Keep in mind that bottled dressings often have preservatives and other additives. Colorful additions – If you like a more colorful pasta salad, adding 1/2 cup chopped red or orange bell pepper adds color and crunch. Shells – You can use several types of pasta including elbow macaroni, shells, rotini, fusilli, and mostaccioli. Is this tuna pasta salad healthy and good for you? 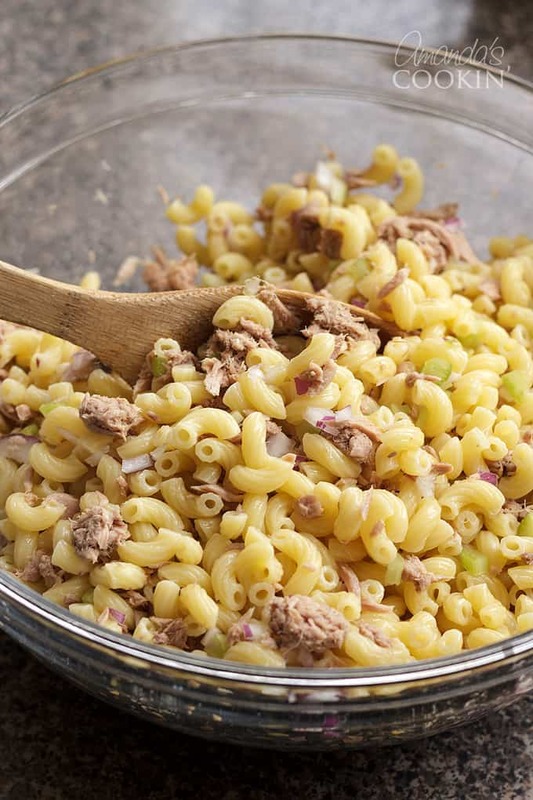 There are 227 calories in this tuna pasta salad recipe. That’s a 1 cup serving, and this recipe makes 9 cups. There aren’t a ton of added ingredients and you are making the dressing from scratch with light mayonnaise, so it’s definitely better for you than using a bottled dressing or adding sugar like some dressing recipes do! This salad has 11 grams of protein and 29 grams of carbohydrates. We use light tuna packed in water to reduce the added calories and fat that comes with tuna packed in oil. How long will this salad last? You can keep this pasta salad in a covered container in the refrigerator for up to 5 days. Start by chopping the onion and celery, juicing the lemon, draining the tuna and measuring out all of your ingredients. 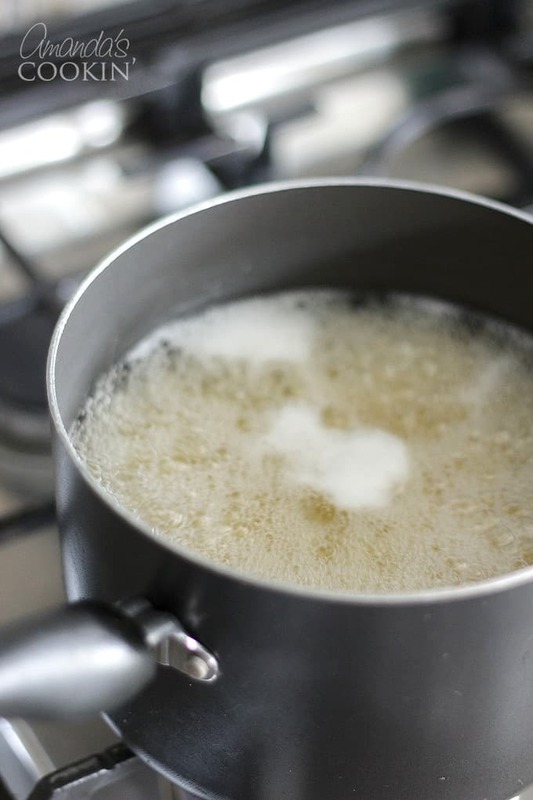 Put a pot of water on to boil and cook the pasta until al dente, usually 6-7 minutes. Check the back of your macaroni box for specific times. When the pasta is done, drain it in a colander and rinse it in cold water. This will stop the cooking process and rinse off any starchy residue. 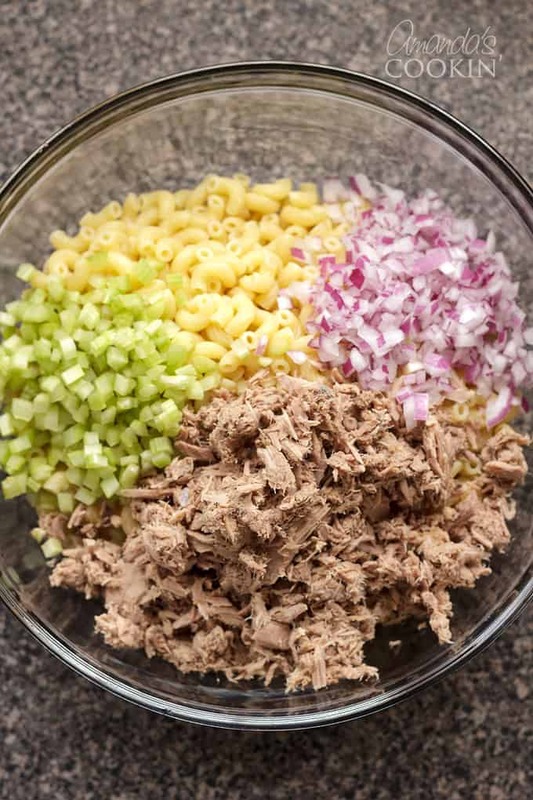 In a large bowl combine the drained pasta, drained tuna, onion, and celery. 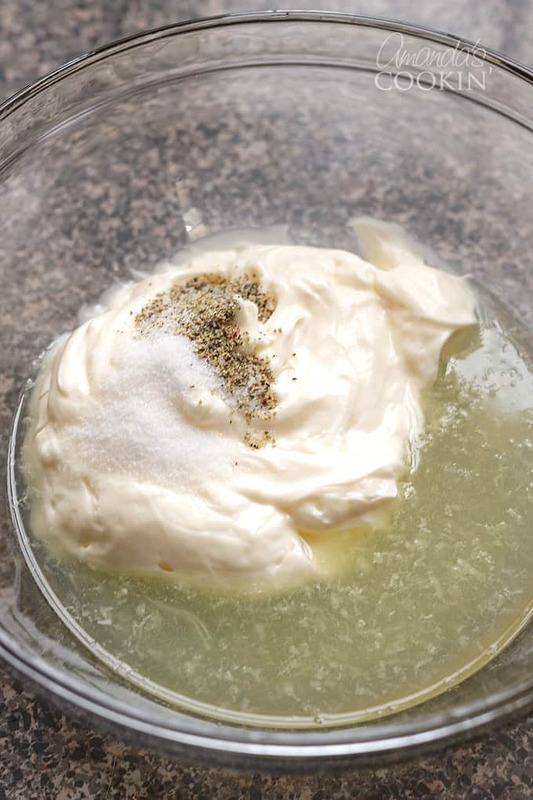 In a separate bowl, whisk together the mayonnaise, lemon juice, salt, and pepper. Add the dressing to the large bowl of pasta ingredients. Stir well to combine everything. It will look quite creamy. The pasta will soak up much of the dressing during the chill in the fridge. 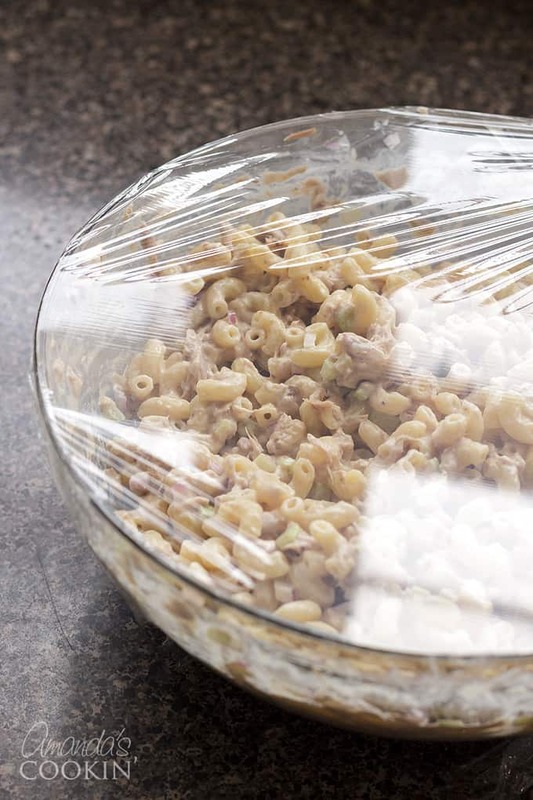 Cover the salad with plastic wrap and place in the refrigerator for one hour. HINT: Don’t be tempted to taste the salad before the chill. The dressing will have a tangy lemon flavor, but this will calm down during the marination in the fridge. We have a lot of salad and pasta salad recipes, but here are some of our all-time favorites! This recipe was originally published on this blog on March 20, 2010. 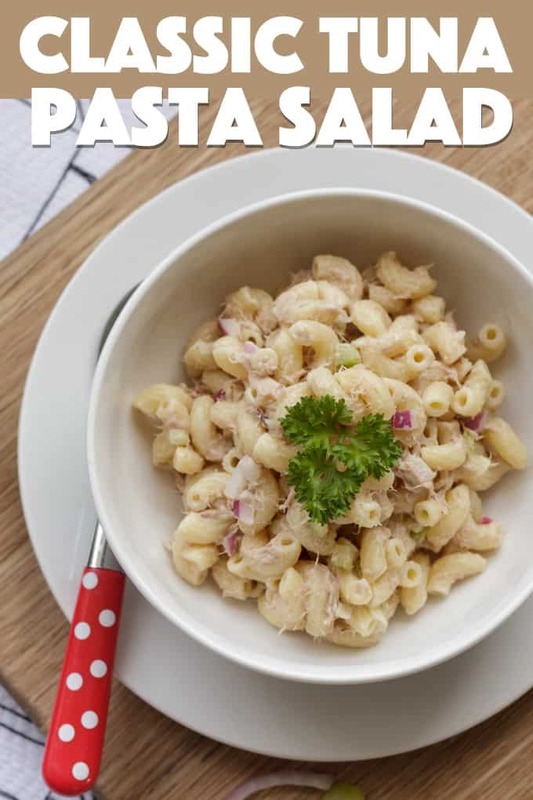 If you're looking for something to take to a potluck or just want a tasty lunch, this tuna pasta salad is easy to make and tastes delicious. 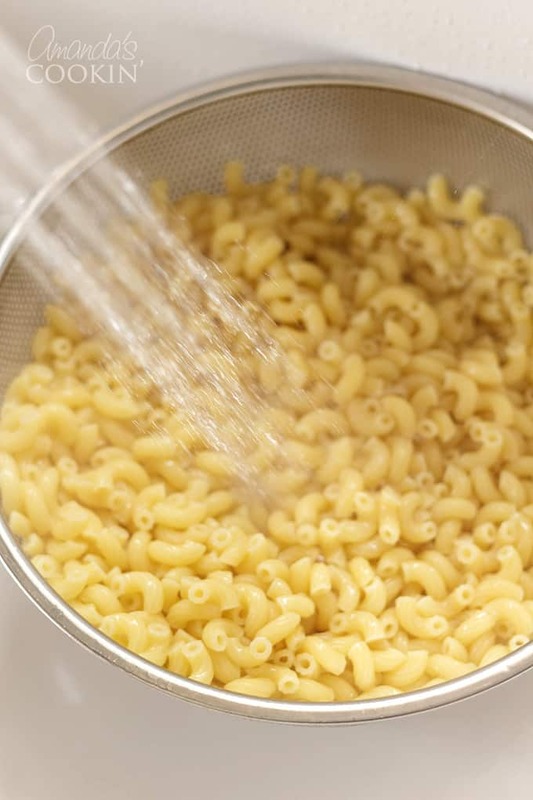 Cook macaroni, drain and rinse with cold water. Add the drained tuna, celery and onion. In a small bowl whisk the mayonnaise, juice, and seasonings. Add to the macaroni mixture and toss with a wooden spoon or rubber spatula. I love this recipe I’ve been making it since I made it with My Mother all of the time growing up. I just finished off the last of a batch yesterday. I also always use the long green onion as well as the Bell Peppers in this recipe. I’ve never used the Lemon juice. I’m allergic to lemons. Everything else yes, right on. & I use mayo… with salt and pepper. Gonna try the dill leaf next time. I agree, it’s been one of our favorites for a long time! Yum, love the mustard idea! I now put a bit of olive oil and lemon juice in any cooked pasta and refrigerate over night before adding other ingredients. Makes a huge difference! Love this recipe, it was comfort food in my youth. Thanks! Thanks for the tip Jo! Thanks! 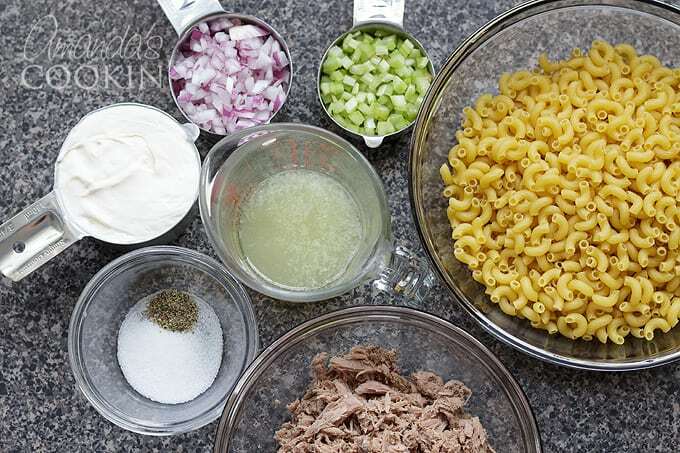 Totally needed a quick “pasta/macaroni salad” recipe and found this of which I had most all of the ingredients! I agree with Cookies & Cups above. I grew up with this salad that my Mom made since the 1950’s in PA. This was an easy meal especially for those Fridays in Lent when we didn’t eat meat. A must to add is “celery seed” in addition to the chopped celery. It gives a unique yummyness to the salad. The salad does not taste like fishy tuna. So if you want to serve the fish protein but not the taste this is a winner for all. I just put this together even in the winter. Can’t wait for it to chill. This type of salad used to be my favorite growing up…one of those things that my mom would make! Haven't had it in a while, so thanks for the recipe!! What a small place the world is, and what an amazing coincidence! I love the tuna salad as much as I love the serving platter! Beautiful!! I have never had tuna in my pasta salad before either and I'm wondering why not? It's a great idea. Another good one Amanda! My Florida seaside town is all about fresh fish, and fishing is one of my favorite hobbies. But I still just LOVE canned tuna. Thanks for another delish looking tuna recipe to add to my growing list! That looks delicious Amanda. I have never included tuna in my pasta salads, but clearly I need to try it, coz that looks amazing! This is one of my favorite comfort foods, but I can't recall ever making it for the kids. I totally need to put this in the rotation! Whenever we make what we call macaroni salad here I use a can of tuna and green peas (thawed frozen peas). It is the only way I really LOVE to eat this salad – but believe it or not…I do not care for Tuna on its own!